hat is a prairie schooner? A prairie schooner is a vehicle of colonization/ it is a vehicle for discovery of the unknown. It destroys/ it inspires. Vehicle: a tool for carrying, as in a covered wagon. Vehicle: the set of words that carries the meaning of a metaphor. Metaphor: derived from the Greek word for transfer or transport. Prairie schooner: a vehicle that transports us beyond the mapped, the experienced, the known—to a place where we challenge and re-make our own meaning. and new work. 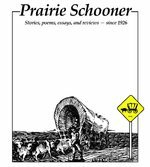 For 80 years Prairie Schooner has been transporting readers to the unknown. Mark Doty’s hilarious account of a visit to a chi gong parlor. Robert Oberg’s intense re-imagining of the Last Supper. New poetry by Peter Pereira, Marvin Bell, Dorianne Laux, Fady Joudah, and UNP author Floyd Skloot. Enlist in the “Texian” army, courtesy of Brent Spencer. Visit small town Minnesota with Carol Bly. Savor Andrew Porter’s exquisite story of physics and love (unrequited and otherwise). Reviews of new books of poetry and prose. Elaine Sexton reviews five chapbooks plus reviews of books by Tim Schaffert, Nicholas Rinaldi, Jack Gilbert, and Bob Hicok. Want to join the wagon train?